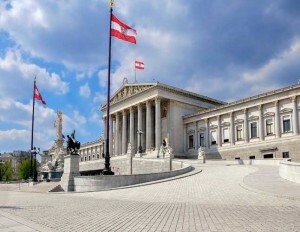 From Austria’s capital city to the centre of the world’s most fashionable boot, there are places you simply cannot miss. Discover Europe’s highlights Bratislava, Budapest, Ljubljana, Venice, and Milan, which deserves a special place with its impeccable fashion reputation and prestigious venues. If you choose to put a cherry on top of your journey, the Eternal City is bound to leave you in awe! 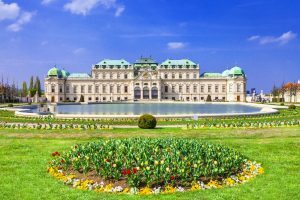 Our multi-day tour package Vienna to Milan includes visiting Austria’s capital Vienna, Slovakia’s capital Bratislava, Hungary’s capital Budapest, some of the most famous Slovenian attractions such as Ljubljana, Postojna Cave and Predjama Castle, as well as the best destinations of Northern Italy: Venice, Verona and Milan. It is a great way to discover the core of Europe and get to know its most popular destinations with world-famous history and tradition. 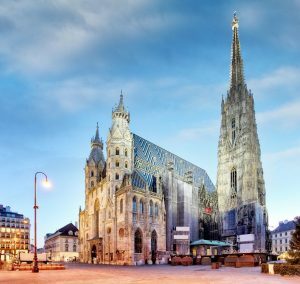 For those of you who wish to experience even more, we upgraded the experience and created the multi-day tour package Vienna – Milan – Rome. It allows you to travel further to the heart of Italy and discover astonishing places such as Pisa, Florence, San Gimignano, Siena, Rome and Vatican in just 16 days. A former epicentre of the Roman Empire has a reputation of the world’s “living art gallery” – and it is certainly justified. Nothing beats the gorgeous landscape of Tuscany and the historical power of Rome! This tour is especially suitable for ambitious travellers, who are ready to embark on a journey of epic proportions. After breakfast, we will check out and drive to Slovakia’s capital city Bratislava. Vienna and Bratislava are the only two capital cities in the world with such a short distance between them (55 km air distance). En route we will pass through the rolling hills of ancient Moravia and modern Slovakia, catching our first glimpse of the wide, blue Danube. We will go on a panoramic tour to see the city’s main attractions. 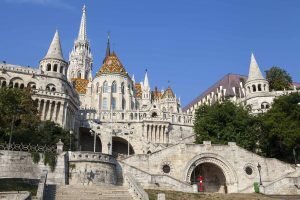 We will see the majestic cathedral dedicated to St. Martin in which, during the time of Turkish occupation of Budapest, the Hungarian kings were crowned. We will walk under the Michalová Tower, the only remaining medieval gate which leads to the city and ranks among the oldest town buildings, see the Renaissance Roland Fountain and the classicist Primasovo (archbishop) palace, where the “Peace of Bratislava” was signed in 1805 after the defeat of the monarchy against Napoleon. On route to the Old Town, there are lovely statues exhibited to warm up the atmosphere, such as the beautiful Naci, Napoleonic soldier, Čumil and others. 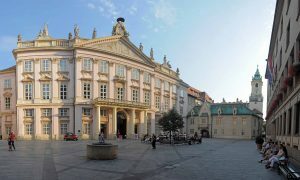 We can also spot Mozart’s palace, where the famous composer had one of his first concerts as a child, the Slovak National Theatre and a monument dedicated to the Danish storyteller Hans Christian Andersen, who visited Bratislava in 1840 and got his inspiration for the fairy tales “The Ugly Duckling” and “The Little Match Girl” there. 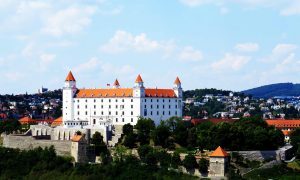 Overlooking the city is the famous Bratislava Castle, where the Celts controlled the trade route and its passage over the Danube from. 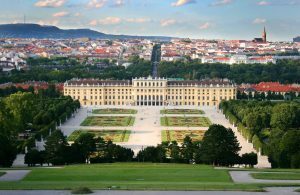 The last major renovation of the castle was commissioned by the Habsburg Empress Maria Theresa in the 18th century, when the castle was renovated in Baroque style. In the evening, we will drive to Budapest, an old metropolis with a turbulent past. The Hungarian capital is also called “the beauty on the Danube”, mainly because of its picturesque location and grand architecture from the golden era of the city in the second half of the 19th century, which gives it a special touch. Overnight stay in Budapest. We will continue our journey towards Slovenia and visit Ljubljana, proclaimed by the European institutions the »European Green Capital 2016«. 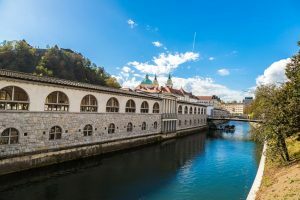 After check-in, our tour guide will take you on a panoramic sightseeing tour of Ljubljana to show you its main attractions, from Prešeren Square and Tromostovje (Triple Bridge) to Town Square with its baroque fountain and Town Hall. We will climb the Ljubljana Castle Hill and admire its panoramic view of this lovely city. Overnight stay in Ljubljana. 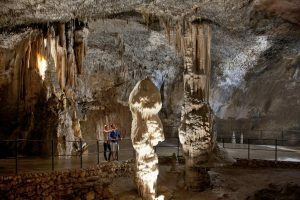 After breakfast, we will visit the Postojna Cave, one of the largest Karst landmarks in the world. An electric train will take us through the tunnels of the cave, which is with its 20 km long cave system the most impressive and the most visited cave in Europe. We will be able to spot human fish, the most famous cave animals in the world that used to be believed to be dragon offspring. 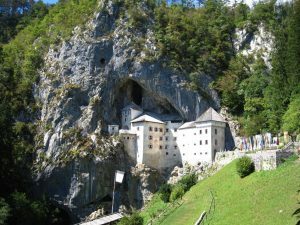 We will continue with a tour of the mighty Predjama Castle from the 12th century, mounted on a 123 m high cliff above the Lokva River. There are many mysterious tales and legends about the castle and its knights. The most famous of them all is the story of Knight Erazem of Predjama, who rebelled in the 15th century against the emperor and became the first Slovenian Robin Hood. Today’s castle is from the Renaissance period and incorporates a museum. In the afternoon, we leave Slovenia behind and head towards Venice. Overnight stay near Venice. After breakfast, our guide will take on a panoramic city tour of this wonderful lagoon port, which is also the capital of the Veneto Region. 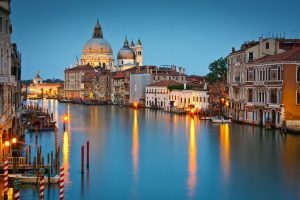 You will get to see the famous St. Mark’s Square and Basilica with its exceptional gold mosaics, the Grand Canal and bridge Rialto, the Doge’s Palace and the evocative Bridge of Sighs, and much more. While walking to St. Mark’s Square and around the town, you will get to feel the romantic Venetian ambience and admire its attractions along the way. While it can be hard sometimes to find your way around the narrow streets of Venice, our guide will make it a piece of cake to navigate them! 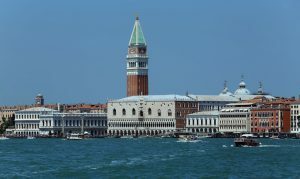 Overnight stay near Venice. 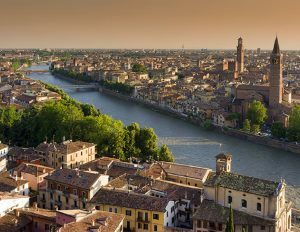 After breakfast, we will travel to Verona, a picturesque town by the Adige River and one of the pearls of Northern Italy. This is where the world’s most tragic love story took place – that of Romeo and Juliet. 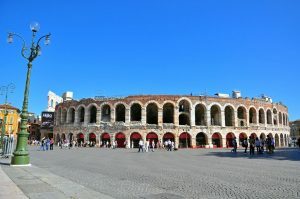 We will go on a city tour to discover its most interesting sites: Piazza Brà (Verona’s main square) with the Verona Arena (one of the largest conserved Roman amphitheatres), Piazza Erbe with its traditional market, Piazza dei Signori, and more. We will take a walk to Juliet’s house with its famous balcony and remember the story of the two lovebirds. Overnight stay in Verona. After breakfast, we will drive to Sirmione. 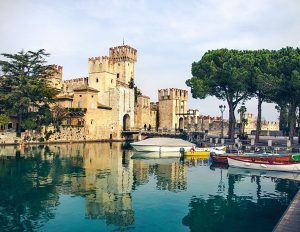 We will go on a panoramic tour around this scenic town with narrow streets that has the Scaliger family’s (ruling Sirmione in the Middle Ages) mark all over it. We will continue by driving to Bergamo and visiting Upper City, “Città Alta”. 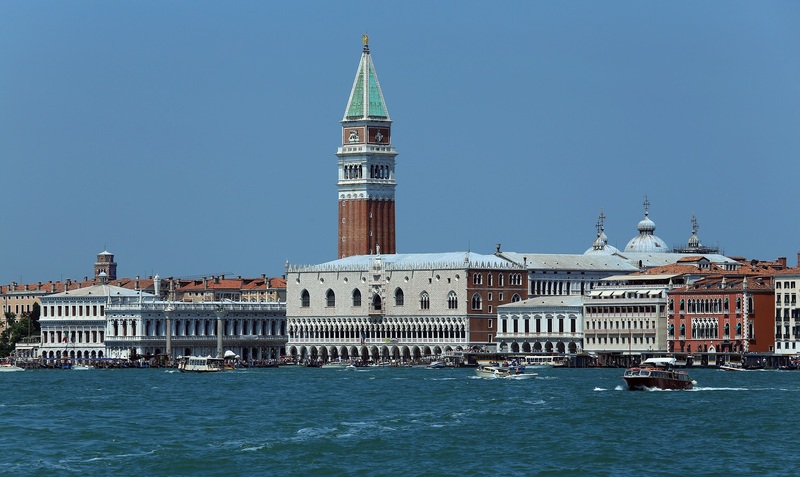 We will see the Gambito Tower, Piazza Vecchia (Old Square), Palazzo Della Ragione (Palace of Reason) from 1199, Colleoni Chapel, Santa Maria Maggiore Basilica, and other attractions. We will walk to Citadella, which offers a magnificent view of Lower Bergamo. After the tour, we will head towards Milan. Overnight stay in Milan. After breakfast, we will go a sightseeing city tour and see Duomo, a famous Cathedral that was being built for a few centuries, hiding the Lombard masters’ most valuable treasures. 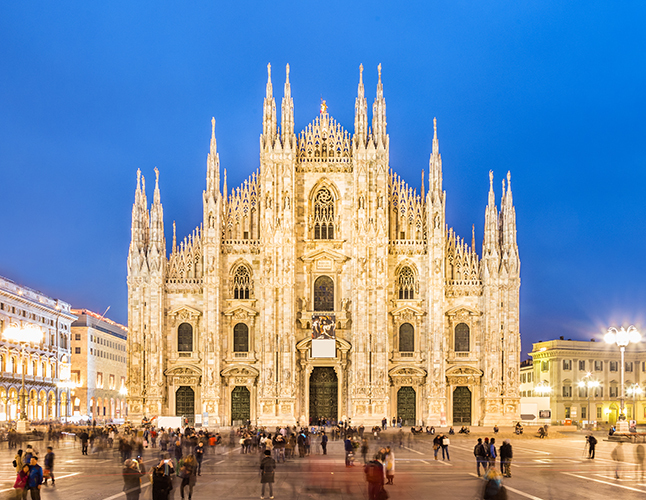 Although the interior is truly magnificent, visitors are blown away even more by its exterior, which is an excellent example of the late Italian Gothic style. A special experience is ascending to the cathedral’s rooftop to see the 2.245 statues of Catholic saints from up close. We will get to see the 15th century Castello Sforzesco (Sforza Castle), which is one of the biggest Italian castles and is decorated with Michelangelo’s and Da Vinci’s magnificent artwork. We will visit Vittorio Emanuele II, where the most beautiful fashion stores and authentic Italian coffee shops are lined up, and conclude the notorious opera house Teatro alla Scala. Overnight stay in Milan. Check-out, transfer to the Milan Airport. After breakfast, we will head towards Pisa, a town stretching over the banks of the Arno River. 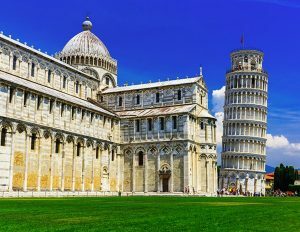 We will visit Piazza dei Miracoli (the Square of Miracles), where the cathedral with the famous Leaning Tower of Pisa and baptistery stands. We will admire the cathedral with its richly adorned façade, five naves and precious accessories, which is the best example of Romanesque architecture, and you will be able to take pictures in front of the tower. We will arrive in Florence in the evening hours. Overnight stay in Florence. After breakfast, we will go on a sightseeing tour and admire this medieval and renaissance pearl from the most beautiful viewpoint – Piazzale Michelangelo, which offers a view of the entire town, its cathedral, the Santa Croce Basilica, Giotto’s Bell Tower and the Arno River that lazily winds its way through the city. We will continue our sightseeing in the heart of Florence: Piazza del Duomo with its baptistery and the majestic Santa Maria del Fiore Cathedral, Giotto’s Bell Tower, Dante’s birth house and the Santa Croce Basilica. 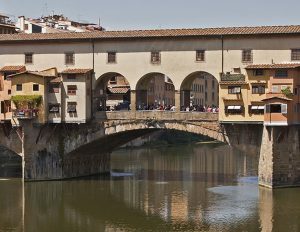 We will stop at Piazza della Signoria, which is a square surrounded by numerous palaces and monuments, visit the Orsanmichele Church (a typical example of Florentine Gothic style) and walk through the Uffizi Gallery all the way to Ponte Vecchio – the notorious bridge that takes you to the Pitti Palace. Evening free for exploring the town on your own. Overnight stay in Florence. 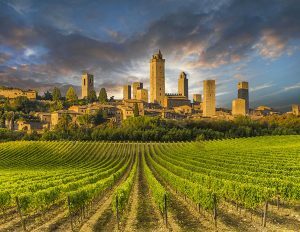 After breakfast, we will drive through the breathtaking scenery of Tuscany, Italy’s most popular and picturesque region, and visit the pearl of Tuscany – San Gimignano. Due to the defence towers that surround it, it deserves the title “Medieval Manhattan”. We will stroll through the town’s narrow streets that are surrounded by a variety of shops, offering homemade Tuscan specialties, and visit the Piazza della Cisterna, the Collegiata Church and Museo Della Tortura (torture museum) inside the Devil’s Tower. 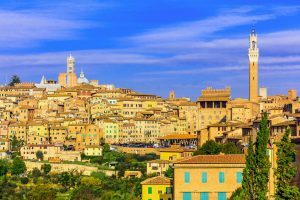 Our route through Tuscany will take us to Siena, where we will visit the originally designed Piazza del Campo, dominated by Torre del Mangia – the highest tower in Tuscany, Palazzo Pubblico, and the Piazza del Duomo with its cathedral. After sightseeing, we will drive to Rome. Overnight stay in Rome. 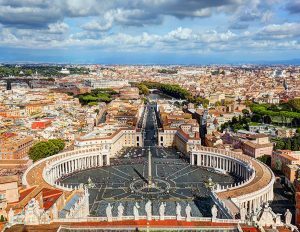 After breakfast, we will go on a sightseeing tour around the Vatican (with a possibility to visit the museums of Vatican (surcharge) with impressive collections from various art history periods, as well as the Sistine Chapel). We will walk around the square and visit the Basilica of St. Peter. If the weather is nice, you are able to climb the cupola and enjoy the breathtaking view of Rome and the Vatican. 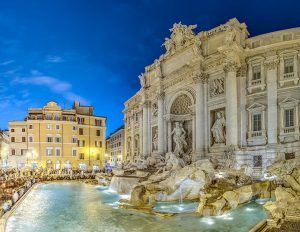 We will take a stroll through the Roman squares and see the main sites: Piazza Navona with the Fountain of the Four Rivers, Pantheon, Trevi Fountain and the notorious Spanish Steps, where top fashion shows are often held. Overnight stay in Rome. *If you are interested in Rome’s mysterious catacombs, we recommend prolonging your stay in Rome for one day to explore them. Check-out, transfer to the Rome Airport. 2 nights in Vienna, 2 nights in Budapest, 1 night in Ljubljana, 2 nights in Venice, 1 night in Verona, 2 nights in Milan (*optional: 2 nights in Florence, 3 nights in Rome). This picturesque town by the Adige River is one of Italy’s most valuable pearls with splendid sites: Piazza Brà, Verona Arena, San Zeno Maggiore Basilica, Piazza delle Erbe with its traditional market, Piazza dei Signori, Verona’s Cathedral, Castelvecchio Museum and Gallery, and Juliet’s house with its famous balcony. 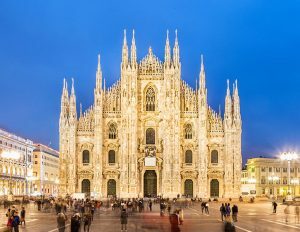 By far the most prominent point of Milan is the Duomo Cathedral, Castello Sforzesco (Sforza Castle) decorated with Michelangelo’s and Da Vinci’s magnificent artwork, Vittorio Emanuele II with Milan’s most beautiful fashion stores and authentic Italian coffee shops, and the notorious opera house Teatro alla Scala. The most beautiful viewpoint is Piazzale Michelangelo, offering a panoramic view of Florence. Walking around the town, you get to see Piazza del Duomo, Piazza della Signoria and other squares, Santa Maria del Fiore Cathedral, Santa Croce Basilica, Orsanmichele Church, Ponte Vecchio, Pitti Palace, Giotto’s Bell Tower, Dante’s birth house and the Arno River. Tuscany is known worldwide as Italy’s most beautiful region, and it’s easy to see why when driving through the countryside, feasting your eyes on the astonishing landscape, or visiting places like Cinque Terre, Maremma National Park San Gimignano, Siena, Chianti, Lucca, Cortona, and Pisa with its Leaning Tower (Torre di Pisa). Rome is recognised as the cradle of ancient Roman civilisation and most definitely a capital with exceptional history and impressive monuments. Among them, the most prominent are the Colosseum, Capitol and Roman Forum. 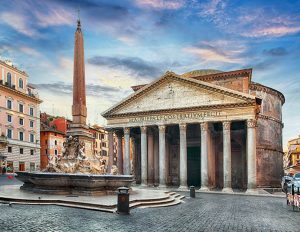 Be sure to also stop by the Spanish Steps, St. Peter’s Basilica, Palatino, Pantheon, Piazza Navona, Trevi Fountain, Santa Maria Maggiore Basilica, as well as other antique buildings, squares and statues dominating the city. And last but not least – the Vatican. Enjoy the view from Ponte Scaligero or Ponte Pietra, shop in the Centro Storico (Old Town), taste the best wine at Antica Bottega del Vino, visit the Renaissance masterpiece Giardino Giusti and follow the footsteps of Romeo and Juliet’s tragic love story. If you are up for some adventure, take a trip to the alpine Lake Garda, the largest Italian lake. If you’re into fashion, art and history, you already know you’ve come to the right place. 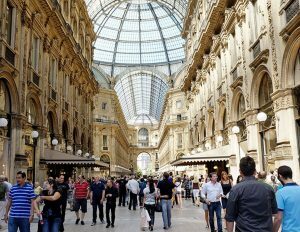 But historic tours and shopping in trendy stores such as Galleria Vittorio Emanuele can be paired with an exquisite culinary experience at Eataly or Pasticceria Marchesi, or visiting the biggest Science and Technology Museum in Italy “Museo Nazionale della Scienza e della Tecnologia”. To discover the beautiful Renaissance legacy, visit the magnificent Uffizi Gallery, Pitti Palace and numerous other palazzos, galleries and museums, to feel the contemporary city vibe, check out Mercato Centrale, to find amazement and serenity, stroll through Boboli Gardens, while dining and wine tasting is an absolute delight you need to experience. The best experiences awaiting you in Tuscany are hiking in nature (especially in Alpi Apuane), taking a hot air balloon flight to watch the rolling hills, vineyards and olive groves passing by, visiting amusement parks such as Parco Levigliese, Cavallino Matto and Acqua Village Follonica, or tasting wine in the famous Chianti Region and truffles in San Miniato. When visiting the Eternal City, give yourself a history lesson in the Capitoline Museums and Museo Nazionale Romano, climb the Spanish Steps, thrown a coin in the Trevi Fountain for good luck, or take your significant other for dinner at Eataly and indulge in delicious gelato. Be sure not to miss Vatican and explore the Vatican Museums, Sistine Chapel and other sites.